2061 N Three Mile Rd. 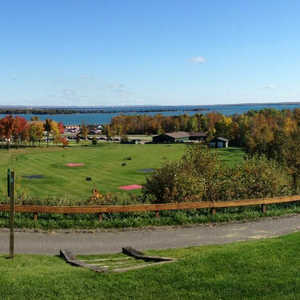 The 18-hole Hessel Ridge Golf Course in Hessel, MI is a public golf course that opened in 1997. 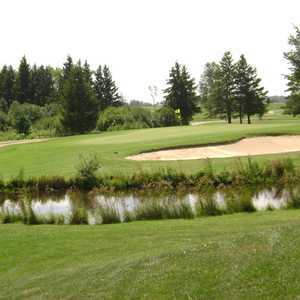 Designed by Jeff Gorney, Hessel Ridge Golf Course measures 6415 yards from the longest tees. The course features 3 sets of tees for different skill levels. Good course, decent conditions. Could mow the fairways and rough more often. Greens have been pretty good last 4 years we have visited. Now for the not so good stuff. The 15th hole is just plain silly, Its a dogleg right with 4 huge pines in the fairway I can accept that has a hazard i guess. The problem is if those trees arent in the way you still have 180 to 200 yards to the green with another large tree in the way. I think its a maple that blocks most shots to the green, and to make matters worse they have planted a pine to the left of it. Thick trees to both sides and trees in the fairway makes no sense to me. The 16 th hole is a dogleg left, lake on the left side, trees on the right. It is a challenging tee shot and a good hole, but once again you have a row of trees planted all along the left side of the lake that someday will block your second shot to the green. Just silly stuff here, the lake is hazard enough. We play the blue tees for the first 14 holes and switch to the whites from 15 on in just to make it more enjoyable. The pro shop lady can be a bit harsh if she is over run by a big rush of customers, but what pro shop isnt these days. Over all another Yooper gem like Newberry that should be enjoyed.